After setting a phenomenal trend on PC and selling tremendously well on Xbox Live Arcade, Mojangs incredibly addictive world-creation game Minecraft has made the jump to physical media! Create buildings, caverns, landmarks... youre only limited by your imagination. If you like, you can invite a bunch of friends along to help you build a masterpiece worthy of showing the entire world. But be quick about it, because at night monsters come out to play, so you need to make sure that you have made preparations for you (and your friends) to stay safe until dawn. 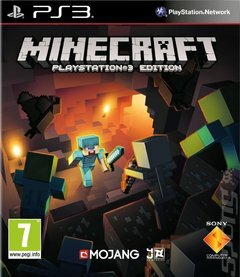 The PS3 Blu-ray release of Minecraft includes all of the console-specific features and benefits that the PSN edition had, including a tutorial mode and various tweaks to make your block-busting activities that much more efficient. If youve not had the chance to buy into the Minecraft experience yet, now is a great time to get involved.